For store owner to change eCommerce platform is, probably, like relocating to another country. No matter how intense and stressful it might be, that's a procedure every successful store owner sooner or later has to encounter. The market of online retail solutions is developing so rapidly making it hard to keep up with all novelties and upgrades. In the industry where today's winners are tomorrow's losers, both new and established platforms constantly improve and release game changing updates to win bigger users base. What do we get in result? Permanent fluctuations and redistribution of an e-platform market share. Store owners migrate their data back and forth, changing the software behind their online retailers more actively than ever before. 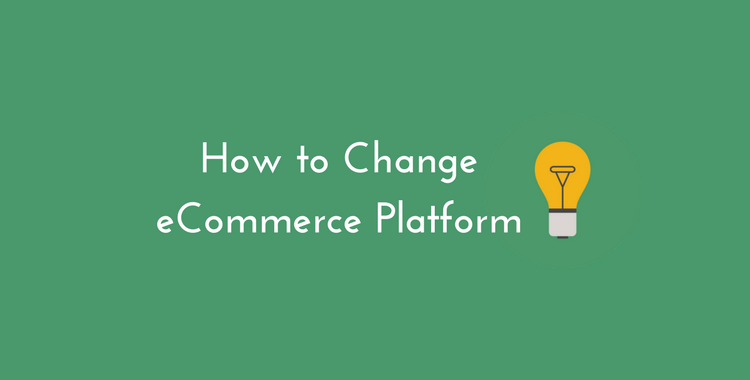 In this article, we`re going to uncover the secrets of how to organize the replatforming process and will discuss all the essential steps to ensure a successful eCommerce platform change. How to Change eCommerce Platform? Do profound research and examine WHAT are the top-ranking eCommerce engines. Be 100% sure of deep awareness of possible methods HOW to change shopping cart. Now when you know what’ll be discussed, let’s dive into discussing all the Whys, Whens, Whats and Hows. We’ll get through the migration procedure scenario by using the most universal and easy-to-use replatforming solution. Why to change eCommerce platform? According to eCommerce software industry user research report, there are 7 main reasons that impact the store owners during the eCommerce platform choice. Are you struggling in managing day-to-day administrative tasks? How often do you think about hiring a developer because all your efforts are in vain? How easily can you tweak and twist the store theme to your taste? Feel that the offered options are outdated and not attractive enough? Observing a high level of shopping cart abandonment? Did you know that according to FounderU research, 51% of users had the frustrating mobile experience and did not complete the checkout due to uncomfortable entering credit card details? Do you feel that your monthly fees are unrightfully high for the functionality offered? Can`t find the necessary app or module to get advanced store functionality meanwhile your competitors are happily enjoying it? How often the solid documentation and support of your platform are helpless? If half of answers are negative, it won`t be a mistake to reconsider the eCommerce platform change. The best time for eCommerce platform change? To uncover the answer just ask yourself: ”When my business revenue is the highest? Take into consideration that any changes applied to your business, should be in alignment with your targets when your sales blossom forth. It`s not recommended to change eCommerce platform before holidays: Christmas, Thanksgiving, Mother’s day, Father’s day, Valentine’s day, Easter, July 4, etc. At this “hustling” period of time the shoppers are especially active and motivated to do purchases. So, your main task is to concentrate on more sales, not on solving migration-related issues. Apart from holidays peaks, it`s important to take into account the peculiarities of your business. If you specialize on selling sunglasses, obviously, the end of spring and first quarter of summer are your shining moments! Don't rush into urgent platform change, don't put yourself or your development team into strict time limits. Make sure you had enough time to test everything accurately and thoroughly. Remember, your main goal is not pushing sales into customers` faces, but satisfying their needs (initially!). Now after we already discovered the essential WHYS along with WHENS, perhaps, we have to move further, to the most decisive part of replatforming. Intrigued? It`s not a secret that highly customizable eCommerce platform becomes a lucky ticket to getting impressive conversion rates. If you can easily apply changes to your site look or functionality of the store regardless your technical intelligence, my congrats, you chose the right shopping cart! We`ll never stop repeating that store appearance matters. In order to ensure of its superpower, put yourself into customers` shoes. Are you willingly stay at site with old-fashioned and stuffy design? Obviously, not. The same won`t visitors. Today`s e-market is full of attractive, inspirational design options that can be beneficially used in dressing up your eCommerce store. For most online stores the primary source of customers` flow is Google that`s why it's not odd how vital it is for eCommerce to be SEO ready. I mean the ability to edit title tags, meta descriptions, pages URLs, images ALT tags, customizable image file names, etc. It helps your website get the top positions in Google search results. If your platform doesn't offer extensions, plugins and modules, bad for you. Thanks to them, you can broaden your store functionality even further! Would be great if your store doesn`t lack a another must-have thing of 2017 eCommerce - advanced app store. Don`t go behind, make sure you`re up to date. It`s crucial for your platform to have the mostly used gateways (PayPal, Authorize.net, Stripe) that ensures to users a pleasant shopping experience. Unfortunately, lot`s of e-platforms have limited payment gateways offering only Stripe, for instance. Such approach can cause inconvenience to the client especially if your online business is targeted at local audience or vice versa is international. Whether you're a tech savvy or a seasoned developer with years of practise behind, you're never immune to issues or are you? Anyway, you'll unlikely deny the access to solid documentation and beneficial support or just for expanding the store functionality by your own. It`s important to say that most hosted solutions offer 24/7 support while open-source ones can boast of extensive documentation and forums. 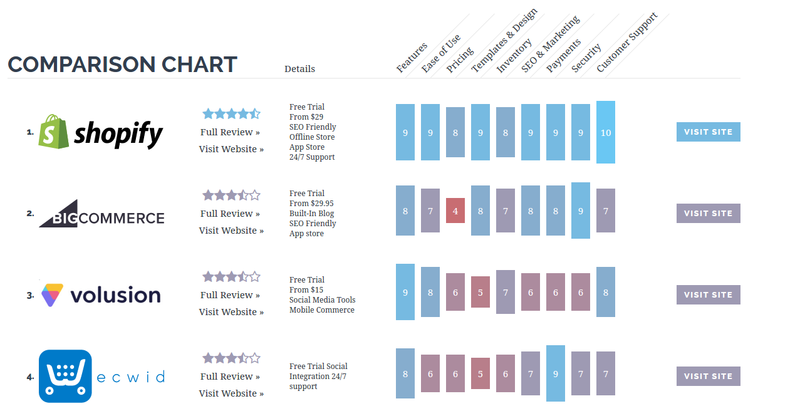 And if you eCommerce engine lacks neither support nor documentation, this article is for you! Hopefully, you're still with us! Ready to move on and find the answer to WHAT engine should you migrate to? Based on this must-have feature list for your future and Cart2Cart`s migration stats, we determined the 3 most popular eCommerce platforms the store owners are eagerly migrating to. They are WooCommerce, Magento, Shopify. 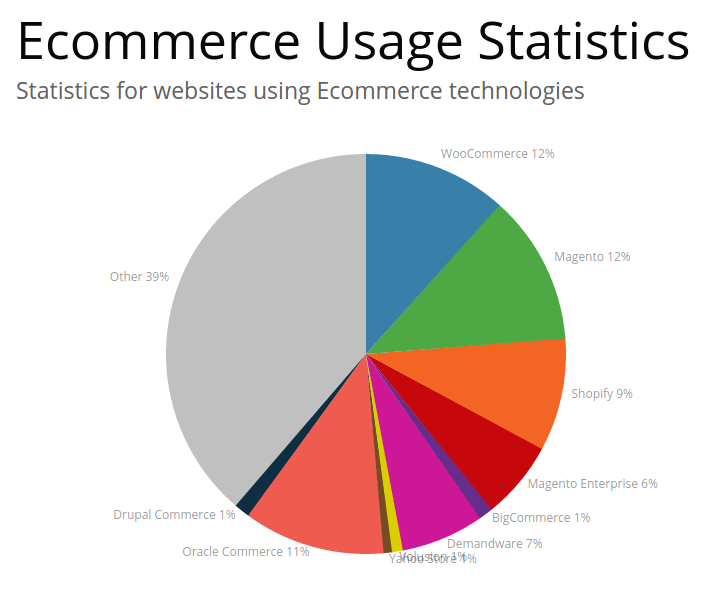 Recent Builtwith eCommerce usage statistics for 2017 year names WooCommerce a leader in online store owners` preference. All that is for good reason. Thanks to its advantageous open-source code-level access and WordPress integration, you're able to customize your site as much as needed. WooCommerce offers you access to over 950 themes where a great part of them are totally free, dressing up your store with unique, eye-catching design. In terms of SEO friendliness, WooCommerce is a lucky ticket. Due to WordPress's integration and its lightweightness, this eCommerce platform has unprecedented loading pages speed and awesome blogging functionality. Speaking of enhanced integration, it's worth saying that WooCommerce goes ahead other solutions offering over hundreds of useful extensions that are structurally categorized into Enhancements, Marketing, Payments, Product Type, Shipping, Store Management, etc. WooCommerce works with a great variety of safe and reliable payment gateways. The well-known are PayPal, Stripe, Authorize.Net. And final touch is support. WooCommerce does not provide 24/7, though it offers access to ever-growing community and ecosystem contributed to by 350 developers. You can find the answer to tech issues in a mouse click. Feel free to take advantage of FAQs and solid documentation that cover the most demanding topics among users. For whom WooCommerce is the best choice? Ready to give it a try? Start WooCommerce migration and enjoy your new live e-store! The runner up in our digest is Magento that counts over 236,691 live websites in BuiltWith records. Regarding customization options, Magento is the most versatile eCommerce solution, providing every tech savvy store owner with unlimited possibilities. We mean Magento 2 fixes in interface management, allowing you to create new products and content faster and with minimal efforts. Considering design peculiarities, Magento has lots to offer. Great part of themes in Magento extension store are fully customizable and responsive on any devices. Magento has no equal in SEO power. This eCommerce engine has piles of out of the box SEO features: products and categories canonical tags, products & home pages meta tags, images optimization, edits of robot.txt files, etc. When it comes to security, Magento is one of the best solution to ensure your store secure stability. What`s more, Magento 2 braintree hosted fields enhancements along with many other security general fixed issues will increase your store's security by protecting all sensitive payment info in checkout. In comparison to Shopify, the next topic of our discussion, Magento is very reasonable solution. Being an open-source platform, it doesn`t have 24/7 support except if you`re ready to pay the exorbitant prices for Magento Enterprise Edition support, of course. Though, can day and night assistance be of any burden if you become a part of such powerful worldwide community with over 100, 000 forum users? For whom Magento suits the best? Feel that Magento is what you`re were looking for your store prosperity? Migrate to Magento effortlessly and securely! Is there any store owner on Earth who hasn't heard of Shopify`s superiority? Bet you, there is no! Despite the fact that Shopify is a hosted solution with comparatively low customization options, it was never an obstacle for this engine to become one of the eCommerce leaders that serves over 325,000 of businessmen worldwide. Thanks to its huge, imagery theme store, you can easily apply the most attractive design to grab move visitors` attention. Apart from it, it has a wide-ranging app store offering tens of beneficial extensions to increase the store functionality, taking it to a new level. There is no limit to perfection, isn`t it? Shopify is ideal solution for multi-channel retail. In a few mouse clicks it allows you to start selling within one Admin Panel on giant social marketplaces: Amazon, Facebook, Pinterest. Isn`t it amazing? What`s more, Shopify includes all important SEO features: editable title tags,, pages URLs, ALT tags for images, meta descriptions, customizable image file names, etc. All that allows you to achieve top positions in Google search results driving more traffic to your site. There is no need to worry about security of payments gateways in Shopify, it provides you with SSL certificate for a safe checkout. It offers more than 70 payment options, the most outstanding ones are: PayPal, Authorize.Net, Amazon Pay, etc. In reference to support, Shopify is a total winner, offering 24/7 responsive customer support to its users. You can get assistance & consulting via email, phone or live chat and all your issues be solved in a speed of light. For whom Shopify is the best choice? Wish to apply all Shopify`s merits to your ideal e-store? Don`t waste your time, take a chance and migrate to Shopify now! We hope that this brief platforms` overview will help (or already did it! ;)) to reach your perfect eCommerce provider, it`s time to move to all your HOWs? How to change shopping cart? Manual by copy-pasting or by manual export / import of csv files. Migration scripts. This way has uncertain quality and requires basic technical skills. There is no 100 % guarantee that all data will be transferred, some entities could not be supported. Developer hiring. You`ll get effective results but be ready to pay a pretty penny. Automated tool. Secure, easy and fast option, with no tech expertise involving. High quality for comparatively low costs. Our recommendation is - Cart2Cart, an automated shopping cart migration service that successfully combines all other solutions benefits. Cart2Cart is not only easy and secure but affordable option too. Optionally, you can perform the migration by yourself without IT assistance or get Cart2Cart`s developer's` assistance to ensure better data customization. How Cart2Cart can help you to change eCommerce platform? Cart2Cart is the world`s popular automated migration solution with more than 45 000 successful data transfers in its record. Effortlessly and securely, it lets you perform a top-notch eCommerce platform change without technical skills required in a few hours. Though a seamless 3-step migration procedure, it moves your database with a widest range of transferable entities from/ to 75+ shopping carts. It cares about your 100% current uptime, allowing you to sell while simultaneously switching to another eCommerce provider. What's more, you can benefit from 24/7 support staff that provides the solutions to any tech-related issues. Ready to take a deep breath and provide your online store with perfect changes? Start a FREE Demo Migrationand change eCommerce platform effortlessly and securely! 2 thoughts on "How to Сhange eCommerce Platform | Ultimate Guide"
Hello there! Thank you for the commentary. We appreciate and take into account all customer suggestions. Maybe, there is something else you’d like to add? Cart2Cart is always ready to help.